Are you spending the Halloween weekend watching scary movies on Netflix? Researching pagan rituals online? Scouring the web for last minute costume ideas? If you are don't have decent Internet access, even those simple tasks can be downright horrifying. If you are trapped as a cable monopoly zombie, you understand the difference between Broadband Tricks or Treats. We created this graphic last year to celebrate the spooky differences between community networks and cable monopolies and it's too good to bury in a shallow grave! Here it is again...back from the (un)dead! View a larger version of this graphic here [pdf]. Stay up to date on community networks with our newsletter! 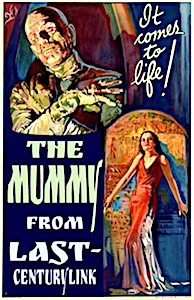 Movie Monster Madness At MuniNetworks! Internet Terror Triple Feature! Much like the the bone-chilling flicks celebrating eerie entertainment that dwells in the depths of our dark imaginations, monster cable and DSL Internet service providers strike terror in the hearts of subscribers…if they survive. Mesmerizing fees, hair-raising customer service, and shockingly slow connections can drive one to the brink of madness. In celebration of Halloween 2016, our writers each selected a national ISP and reimagined it as a classic horror character. The results are horrifying! Read them here…if you dare! 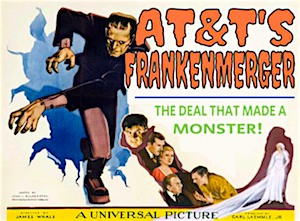 This shocking film tells the horrific tale of a mad scientist in his quest to create the world’s largest telecommunications monopoly monster. The scientist’s abomination runs amok, gobbling up company after company, to create a horrifying monster conglomerate. Watch the monster terrorize towns across America as it imposes data caps, denies people access to low-cost programs, and refuses to upgrade infrastructure. What nightmare lies ahead? Will the townsfolk and their elected officials unite to stop the monster, before it acquires Time Warner? Watch and find out! This is episode 223 of the Community Broadband Bits podcast. Eleven communities in Northern Utah are now served by a regional open access fiber-optic network, UTOPIA. Perry City's Mayor Karen Cronin and UTOPIA's Executive Director Roger Timmerman join the show. Listen to this episode here. Karen Cronin: We don't have the money that some of the lobbyists are getting from big companies, but we have a voice and I think that our legislatures will listen to local voices if they have the courage to step forward. Lisa Gonzalez: This is episode 223 of the Community Broadband Bits podcast from the Institute for Local Self-Reliance. I'm Lisa Gonzalez. The Utah Telecommunications Open Infrastructure Agency, also known as UTOPIA, began serving north-central Utah in 2004. The regional open access fiber-optic network has had its share of challenges since launch, but has slogged through them to now bring healthy competition to residents and businesses in 11 communities. Joining Chris this week are the mayor of one of the UTOPIA cities, Karen Cronin from Perry. Roger Timmerman, executive director of UTOPIA, is also part of the conversation. Our guests share stories about how competition has benefited local businesses and residents. They also describe infrastructure sign-up choices they have as property owners in a UTOPIA community and what it's like to have more than one or two ISPs at your feet. Now here are Chris, Mayor Cronin from Perry, and Roger Timmerman, executive director of UTOPIA. Christopher Mitchell: Welcome to another episode of the Community Broadband Bits podcast. I'm Chris Mitchell. Today I'm speaking with two wonderful guests from the state of Utah. Roger Timmerman is the executive director of UTOPIA, the Utah Telecommunications Open Infrastructure Agency. Welcome to the show. Roger Timmerman: Thank you. Thanks for having me on. Christopher Mitchell: Perry City mayor, Karen Cronin. Welcome to the show. Karen Cronin: Thank you. I'm delighted to be part of the conversation. The city of Davis, California, recently released a Request for Proposals (RFP) for a citywide fiber-optic feasibility study report. The community wants to consider the options for a Fiber-to-the-Home (FTTH) network. Responses are due October 31. The study should provide an analysis of options for engineering, constructing, provisioning and operating a high speed citywide FTTP network. It should feature both physical and network transport layer components required to pass and potentially connect every home, business, apartment complex, and institutional building within the City of Davis. The analysis should also consider future use at strategic infill and edge points around the City in order to support network growth through the coming decades. Davis wants firms to consider public private partnerships, the city’s network as an open access infrastructure, and Davis is only an infrastructure provider. In early 2015, a group of citizens formed DavisGIG to encourage community leaders to move forward by establishing a Broadband Advisory Task Force and the feasibility study. In March, Davis established a task force to examine the possibility of deploying a network to serve municipal facilities, community anchor institutions, businesses, and residents. Incumbents Comcast, AT&T, Omsoft, and non-profit Davis Community Network offer a wide range of services now and there is little consistency for the city’s 68,000 residents. The University of California Davis (UCD) is a major employer, as is the State of California. According to the RFP, there is a growing entrepreneurial culture springing up in Davis due to the presence of UCD’s research environment. The community wants to feed that growth with a citywide, future-proof, FTTH network. Send questions to Diane Parro, Chief Innovation Officer: clerkweb(at)cityofdavis.org. Saint Louis Park, a compact community along the west side of Minneapolis, has built an impressive fiber network, a conduit system, and several deals with developers to ensure new apartment buildings will allow their tenants to choose among high speed Internet access providers. Chief Information Office Clint Pires joins me for Community Broadband Bits podcast 219. In one of our longest episodes, we discuss how Saint Louis Park started by partnering with other key entities to start its own fiber network, connecting key anchor institutions. Years later, it partnered with a firm for citywide solar-powered Wi-Fi but that partner failed to perform, leaving the community a bit disheartened, but in no way cowed. They continued to place conduit in the ground wherever possible and began striking deals with ISPs and landlords that began using the fiber and conduit to improve access for local businesses and residents. And they so impressed our previous podcast guest Travis Carter of US Internet, that he suggested we interview them for this show. Clint Pires has learned many lessons over the years and now we hope other communities will take his wisdom to heart. Well-managed communities can make smart investments that will save taxpayer dollars and drive investment in better networks. Read the transcript of the episode here. This show is 40 minutes long and can be played below on this page or via iTunes or via the tool of your choice using this feed. On September 6th, the Nashville Metro Council approved a proposed One Touch Make Ready (OTMR) ordinance by a wide margin of 32-7 on a roll call vote (computers were down). This was the second vote to advance the ordinance, designed to streamline deployment of fiber-optic networks in a city looking for better connectivity. Elected officials responded to Nashville residents who flooded their council members’ offices with emails. The Nashville Metro Council will take up the ordinance one last time; passage could speed up competition in the country music capital. Google Fiber has been pushing for a OTMR, while incumbents AT&T and Comcast look for a non-legislative solution to the problem of the poles while protecting their positions as dominant Internet Service Players (ISPs). The city of Nashville sits on limestone, a rock that cannot support the trenching and underground work of fiber deployment. The only other option is to use the utility poles. Eighty percent of the poles are owned by the public utility Nashville Electric Service (NES), but incumbent provider AT&T owns the other 20 percent. Google Fiber says it needs to attach fiber to 88,000 poles in Nashville to build its network and about half of those (44,000) need to be prepared to host their wires. Pole attachments are highly regulated, but there are still gray areas. Susan Crawford provides an overview of the policies and regulations on BackChannel; she accurately describes how poles can be weapons that guard monopoly position. Currently, each company that has equipment on the poles must send out a separate crew to move only their own equipment. This process can drag on for months. The OTMR ordinance is a deceptively simple solution to this delay. Fauquier County, located less than an hour west of Washington, D.C., recently formalized a contract with a Virginia-based consultant to develop a broadband Internet strategy for the county. The county is home to nearly 70,000 residents, many commute to work in D.C.
Fauquier County had the eighth-highest median income in the United States in 2011, yet its rural residents lack high-speed Internet access options. Large corporate Internet service providers (ISPs), Comcast and Verizon, deliver high-speed Internet to profitable markets in Fauquier’s largest towns, Bealeton, Warrenton, and Marshall. However, due to low population densities and low projected returns, incumbent ISPs did not invest in broadband infrastructure upgrades that rural communities need. Earlier this spring, the county government created the Fauquier Broadband Advisory Committee (FBAC), a ten-member committee tasked with exploring Internet accessibility solutions for the county. The recently approved feasibility study is the first step to bringing rural residents the services they require. The $60,000 assessment and feasibility study will prioritize economic development opportunities and quality of life improvements for Fauquier residents. The study also aims to map county demand and assess how to best deliver last-mile coverage to the entire county, including the 57 percent of residents who live in rural areas. The consultant released two countywide broadband surveys to pinpoint local interest, one for residents and another for businesses. Lake Oswego School District (LOSD) in Oregon is set to make an investment that will save up to $301,000 per year in telecommunications costs - its own dark fiber network. To Lease Or To Own? There Is No Question! LOSD is the latest in a string of local schools that have chosen to invest in fiber infrastructure for long-term savings. Caswell County, North Carolina, is also investing in dark fiber with an eye on the future. Because the school district will own the network, they will no longer be surprised by unexpected rate hikes, making budgeting easier. The money they save can be directed toward other programs and, because it is dark fiber, they are only restricted by the equipment they install and the bandwidth agreements they enter into with Internet Service Providers (ISPs). Some schools choose to become ISPs themselves or join collaborations in which they can purchase bandwidth collectively to save even more. According to Joe Forelock, the district’s assistant superintendent for academic and student services, “This is a long-term investment for the health of the district over the next many, many years.” Once the network is in place, it will cost approximately $36,720 annually to maintain it, which is 89 percent less than what Comcast plans to charge LOSD for the 2016 - 2017 school year. We want to note that Comcast tripled their rates from the 2015 - 16 school year, in part because the 2016 - 17 contract was only for a year while the dark fiber network is being constructed. With no competition in the region, Comcast has broad practical authority to decide what LOSD will pay. “Right now, Comcast is essentially the only game in town in many communities," Morelock says, "including LO." Clackamas County will install the $1.54 million network; 40 percent of the total cost will be reimbursed through E-rate, the federal program for schools that pays for Internet access and certain infrastructure expenses. “After six years, if costs remain the same and do not increase, or decrease for that matter, the district will save $181,000 per year in connectivity costs with the E-rate discount, or $301,000 per year if E-rate were to disappear,” Morelock says. In 2015, Nashville welcomed Google Fiber with open arms, anticipating all the possibilities gigabit connectivity could mean for businesses and residents. The deployment is moving slowly, however, in part because of time consuming make ready work on utility poles. In order to speed up the process and establish better policy for the city in general, Nashville has just introduced a one touch make ready ordinance. The thousands of poles that stand around the city, most of which are owned by Nashville Electric Service, are arranged with power on top and communications equipment in a line below that. In Nashville, this means NES equipment pushes electricity up top, while broadly speaking, gear from Comcast and AT&T — whether for home phone, cable or internet service — operates below. Enter Google Fiber. Because Nashville largely sits on a massive bed of limestone rock, running cable underground is, for the most part, not a viable option. That means Google has to join its new friends in the industry on the poles, through a process known as Make Ready. In a typical scenario, that involves Google — or any other new company trying to enter the market or get on a particular pole — notifying NES, which will then notify each telecom company that it needs to send a crew to the pole — one after another — to move their equipment and accommodate the new party. The process can take months, even if contractually mandated time frames are followed. Google Fiber officials and operatives working on their behalf suggest that’s not always the case. The issue is, does our community control our own fate, or does someone else control it?